NYC Bloggers map. You can click a subway stop and find all the bloggers in the vicinity. Maps are an important tool for visualizing data and space. 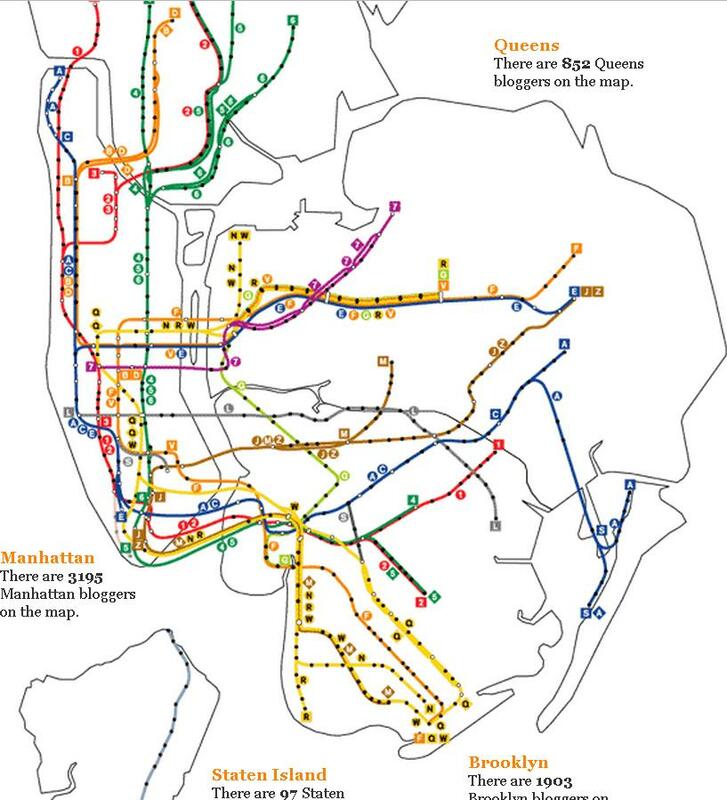 New York City is blessed with one of the most comprehensive and well-designed maps of public transportation and biking. The city is also home to a highly educated population, which means a healthy, local blogosphere. The website NYCBloggers.com shows a map of where bloggers are located and organized by subway stop. For readers in search of bloggers at a geographically specific site, such a website is an excellent resource — if well-researched and publicized — and has the potential to reveal the broad cultural, economic and social dynamics of a city. Where are the writers, watchdogs and engaged populous located? And what do they choose to write about? At the very least, it’s way to further localize information and think about blogs not simply as cyber entities of information but as based in a physical location. Perhaps other efforts to build the localization of blogs will amplify accountability and build the “weak-tie world” of bloggers and internet-based social networks that Malcolm Gladwell recently wrote about. Plus, for urban planners, transportation advocates and citizen watchdogs, mapping blogs strategically can be a useful resource that further contributes to placemaking in both the virtual and physical world. Mapnificent: How Far Can You Go in 15 Minutes? All the Stops in Washington, D.C.?